” In 2014 it was reported 45 per cent of surveyed Indigenous mothers smoked during pregnancy, compared to 13 per cent of non-Indigenous pregnant women. Those figures have spurred University of Newcastle associate professor Gillian Gould to study what can be done to help reduce rates of Indigenous women smoking while pregnant. Currently we have received EOIs from about 20 ACCHS in 5 states that we are targeting for the SISTAQUIT study. These states are NSW, QLD, SA, WA and NT. These sites will now undergo a two-way discussion for mutual interest, and to find out what protocols we need to go through to get their communities signed up. We are aiming for 30 services to be signed up to SISTAQUIT by end of the year. We will have a trade table at the NACCHO AGM, so interested CEOs and managers of ACCHS can get more information, meet with Joley Manton face-to-face, and sign up their interest or consent. Our pilot study “ICAN QUIT in Pregnancy” has been successful wrapped up, and we are applying our learnings to go forward to this larger SISTAQUIT trial. We would like to thank pilot ACCHS services in NSW, SA and QLD for their tremendous support in making this happen. What does the SISTAQUIT™ in Pregnancy study aim to do? 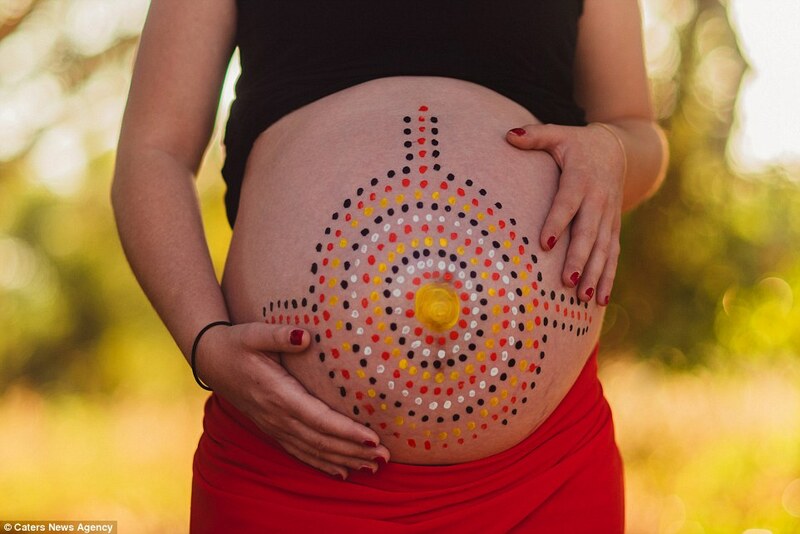 Our study aims to improve the provision of timely, evidence-based smoking cessation support to pregnant women attending Aboriginal Medical Services (AMS), by training health providers such as GPs, Aboriginal Health Workers and midwives in culturally appropriate smoking cessation care. The SISTAQUIT intervention (culturally appropriate smoking cessation training for health providers) has been developed over a decade. 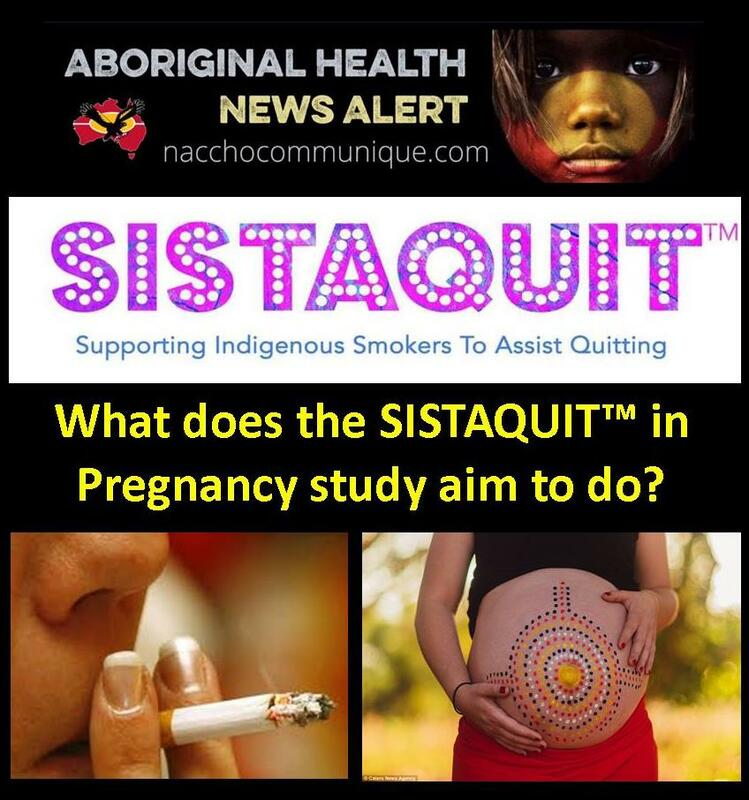 We most recently explored the feasibility and acceptability of the SISTAQUIT intervention through the ICAN QUIT in Pregnancy pilot study with six Aboriginal Community Controlled Health services. We aim to increase the proportion of health providers offering assistance in quitting to pregnant smokers and to improve the quit rates of pregnant smokers, measured by carbon monoxide testing during pregnancy and after birth. We also aim to improve birth weights and respiratory outcomes of the babies in the first six months of life. We are currently seeking EOIs from AMS interested in participating in the trial. Funding is available to cover AMS trial participation costs, and pregnant mothers will be offered a voucher for their time for each study visit. SISTAQUIT project aiming to help 450 Indigenous women quit smoking. “We want to show that SISTAQUIT works, and that women are able to quit with our approach. We wanted to be able to reach out eventually to any service in Australia through the internet, so we decided to do that through interactive webinars. It is hoped a large-scale research project will help provide clearer solutions for tackling smoking rates among pregnant Indigenous women across the country. In 2014 it was reported 45 per cent of surveyed Indigenous mothers smoked during pregnancy, compared to 13 per cent of non-Indigenous pregnant women. It’s not only that they may be born with low birth rate, or have risks of premature birth, but it can set them up for things like obesity, diabetes, a higher risk of heart disease, and lots of respiratory illnesses. “From that point of view, it is important. Associate Professor Gould has been working on the multi-phase research project for a number of years. In the first phase of the study, the research team worked with Indigenous communities in the NSW Hunter Valley to develop a suite of resources to train health providers in supporting women while they quit smoking. Many of those resources have been digitally focused. Phase two involved a pilot project using those resources, and was implemented in NSW, South Australia and Queensland. With the pilot study finished, the research is now expanding into 30 Aboriginal medical centres around the country, with the SISTAQUIT project aiming to help 450 Indigenous women quit smoking. “We will link up with the services, and we’re conducting three one-hour webinars, which will be live and interactive,” Associate Professor Gould said. “We [also] have this booklet that women receive, and within that booklet are embedded different videos. “The women can use an app on their phone, and when they scan the little screenshot of the video that’s in the booklet, they can hear [information] from Aboriginal and Torres Strait Islander health professionals which is going to help them quit smoking. “We’re mainly aiming it at the health professionals — GPs, midwives, Aboriginal health workers — to give them training, and then they have these resources that are going to, in consultation with women, help them quit. Cultural sensitivities are observed in the training materials, and Associate Professor Gould said that helped build trust. “We’re talking to women, giving them accurate, factual messages, but in a way that’s delivered by people they would trust,” she said. The study is set to last until 2021, and Associate Professor Gould was optimistic the approach would help reduce rates of smoking. “This is the real world; it’s a real-world study, so this is what life is like,” she said. “In our pilot study so far, we’ve had four women quit out of 22, which means we’ve already got a quit rate of almost 25 per cent. The usual quit rate is about 3 per cent. So, we think we’re doing pretty good. “We’re aiming in the bigger trial to improve the quit rate from the baseline of 3 per cent up to 11 per cent, but already in our pilot we’ve exceeded our aim.